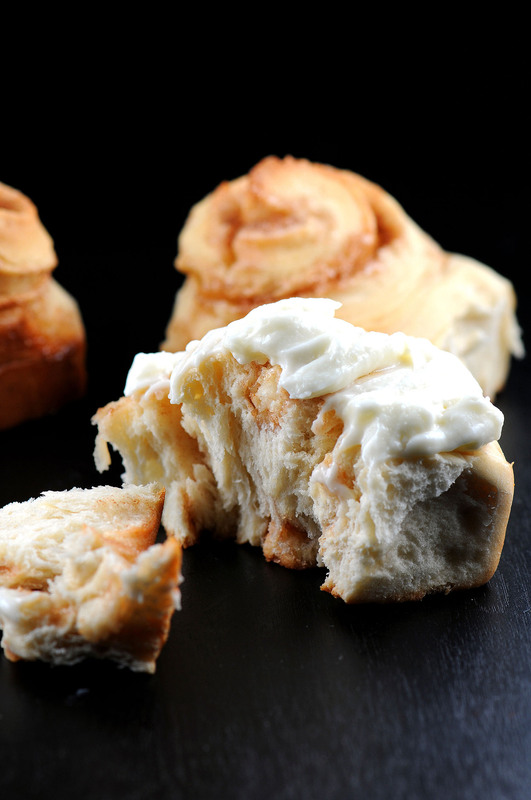 A holiday version of cinnamon rolls infused with eggnog and covered in a bourbon-spiked cream cheese frosting. Combine 6 tablespoons of the sugar, the salt, and the butter in a large bowl, pour the hot eggnog over it, and let cool to 110-115°F. Add the nutmeg and flour; mix until the dough is soft. Transfer the dough to a well-floured board and knead until very smooth and elastic, about 5 minutes (you can also use a stand mixer with a dough hook if you don’t knead by hand). Place the dough in a large, well-greased bowl, cover with plastic wrap, and let rise until doubled in volume, about 1 hour. Punch the dough down, place on a well-floured board, and roll it out into a 10x14-inch rectangle and brush it with the melted butter. Combine the sugar and cinnamon and sprinkle the mixture over the butter. Starting at one of the long sides, roll the dough up, and pinch the seam tight to seal. Using a serrated knife, cut the dough into 2 inch thick slices, and place them in the prepared pan. Cover with plastic wrap and let rise one more time, until doubled in size, about 1 hour. When the rolls have risen, bake until golden brown, about 25 minutes. Let cool for about 5 minutes. While rolls are cooling, prepare the icing (recipe follows). Drizzle the icing over the rolls and serve warm. Mix all the ingredients together until smooth. If too thin add more powdered sugar; if too thick, add more eggnog. They are great. I added one cup of dried cherries plumped in any type of fruit juice, I used pineapple. Heat and cover for a few minutes and pour liquid into the dough mixture, or use it to proof the yeast. Excellent recipe. Mine turned out large and delicious. Excellent! These turned out huge, light, and fluffy. These will be a “must do” every holiday season.